The best feature about Android is that is easily customizable. There are lot of ways using which you can customize Android operating system. The best way is Android Launchers. 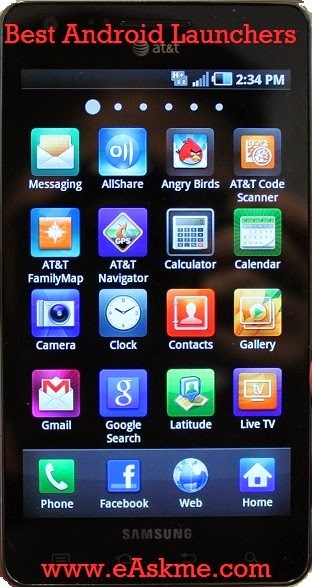 This is most popular Android Launcher. It has some paid features also. Free version also very impressive but it don`t give u widgets. This make your social networks available on screen. Its homescreen transition and #d app drawers are awesome features. For moe widgets you have to purchase it for $3.49. If you want to try another launcher than you can try ADW Launcher. It is available in 500 different themes. There are lots of features available in its paid version. you can purchase it for $3.29. If you have an old device and because old android devices do not get new updates, so for those this Zeam Android Launcher is the best. It is compatible even with older versions of Android. It is very fas and responsive and use very less resources. If you want to customize an expensive Android device in whole new perspective and also ready to pay $14.95 then SPB Shell 3D is for you. This gives you best customization. Its performance, functionality, aesthetics, performance everything are out of world. This works best only with expensive android devices with awesome hardware. This is a free Android launcher with lots of functionality and customization options. It has 3 tabs for App drawer Running, Recent and All. It also let you close running apps. It also have lots of different themes. These are the best Android Launchers available online to give new look to your android device. Do share which Android launcher you prefer to use ? Also subscribe eAskme feed to get more updates in your email.